"There weapons are GUNs and our's are Civil Disobedience". The poster has a picture of Gandhi implying peaceful struggle and disobedience. University students held demonstration in front of the Embassy of Saudi Arabia in New Delhi on 28th March, in solidarity with Arab uprising, and against Saudi brutal invasion in Bahrain in the continued presence of Fifth Fleet of US on Friday. 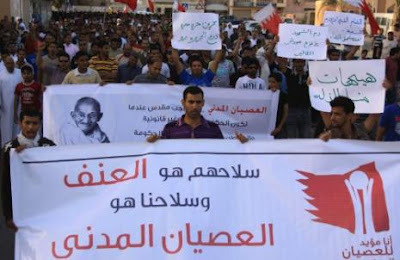 The protest was organized under the banner of Indian People's Solidarity with Arab Uprising. For me, this is pretty much a “no-brainer” type of statement. While there may have been a period of time when I was in Elementary, Junior High, or High School where I reflexively supported the nuclear industry because “We’re America and we can do everything,” once I actually started thinking seriously about the topic of nuclear power, it became glaringly obvious to me that it is unsupportable. I am not a scientist but as I’ve watched and read as thing have unfolded in Japan, it has been reinforced once again that the scientists are often just as clueless as the rest of us. For every scientist who resigns over design flaws, I would wager there are one hundred who just see it as business as usual (and no, I don’t have anything to back that statement up other than a gut feeling – so we’ll call it a WAG.) Chernobyl. Three Mile Island. Fukushima. These are just the best known few of the nuclear disasters that we are aware of.